Due to today’s forecast rain, there is a small stream flood advisory for Fairbanks. This advisory is not likely to impact our fire operation, but always use extreme caution when enjoying the great outdoors. The Healy Lake Fire started on June 16, 2015 approximately 28 miles southeast of Delta Junction, Alaska. The cause was lightning. The acreage total today is 10,298. The fire is reported as 31% contained. We are preparing long-term fire management strategy that will identify appropriate responses to fire activity as it develops. Today’s rain is reducing fire activity, but we are prepared to increase our activity as warming and drying trends occur. Crews will continue point protection around structures. Structure preparation is being conducted on numerous values at risk. Contingency line location on the north flank of the fire is being identified. Values needing improved protection are also being identified in Healy Village. Backhauling of empty fuel drums, excess equipment and supplies will continue. We will continue to monitor by air. Cooler temperatures, highs in the upper 50s with rain expected throughout the day and into tomorrow. There are 2 light helicopters currently assigned to this incident; plus 1 medium helicopter is based here and available, unless needed for initial attack of a new fire or other higher priority use. An air attack platform is being shared between Healy Lake Michigan Creel and Fires. 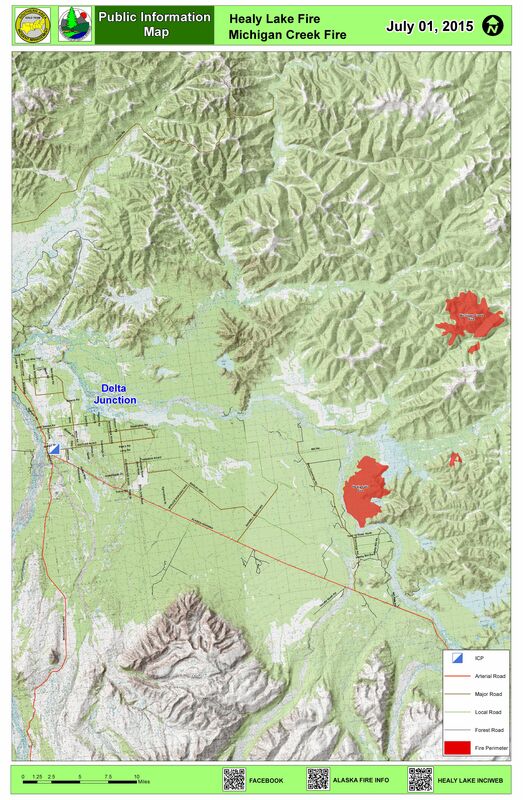 Healy Lake aircraft will support new fires in the Delta response area should they be requested. In addition, 1 air attack aircraft is based in Fairbanks and assigned to this incident. Other resources: 1 Type 1 Crew, 4 Type 2 Crews, 3 Dozers, 14 Boats, and 1 Water Tender. The Burn Ban has been lifted for most of Alaska, including the Delta Area. It is still in effect The burn closure is still in effect in Southwest Alaska and the Municipality of Anchorage. For more information regarding restrictions, visit http://www.akfireinfo.com.